Second Life and Religion ‹ Following The Way . . .Together! Second Life is a 3D virtual environment originally conceived as Linden World in 1991 by Philip Rosendale (aka Philip Linden), Linden Lab CEO and founder. Curious about the ways humans manipulate worlds, his team launched a beta version of this virtual world in November 2002 and went public in July 2003. In 2009 SL boasted over fifteen million residents and over 20 million residents in 2011. These residents engage in every form of social, economic, political, commercial, and religious life during a typical SL day (Los Angeles CA time) with gorgeous sunrises and sunsets. During one’s first visit to SL, new residents choose a name and create a stylized avatar. Derived from Sanskrit meaning incarnation, these avatars -conceptually freed from societal and physical limitations of ethnicity, gender, sexual orientation, class, or geography – represent the resident with personally designed bodies, physical movements, gestures, and clothing. Some are outrageous; however, it appears that many residents depict their idealized self or use their self-creation as an opportunity to experiment with who they would like to become. SL Residents can communicate privately with another resident or publicly with anyone in a virtual location using text (instant messaging) or voice (computer microphone). They can engage in every conceivable form of commerce using Linden dollars, and are governed by both local and global codes of conduct. They typically claim a home in a region which defines its own rules and agree to abide by SL standards for public areas which include avoiding intolerance, harassment, assault, disclosure, indecency, and disturbing the peace. Free to choose any form of self expression so long as it is mutually agreeable, avatars can explore realistically displayed 3D landscapes, watch films at movie festivals, learn in educational institutions, participate in sports, visit art exhibits and museums, imbibe at bars, or engage in sexual activity. Within this mix, some residents have created environments for spiritual seekers and religious practitioners. Avatars can light virtual candles for Shabbat, teleport to a Buddhist temple, consult an oracle for divine guidance, or join a virtual church. Jeremy Nickel’s demonstrated navigation in Second Life while providing an overview of spiritual spaces in Second Life including a Unitarian Universalist church, a Roman Catholic church, a Mosque, a Buddist Temple, and a Synagogue. 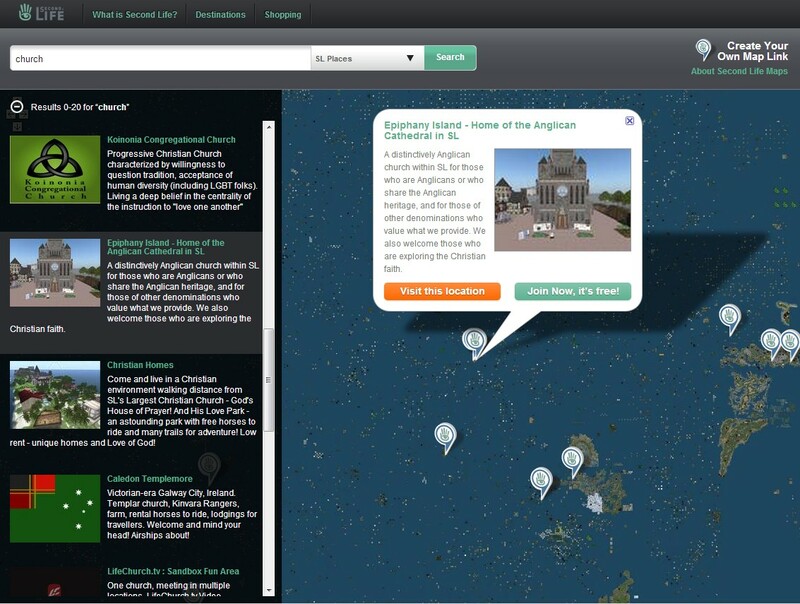 JayG provides description of various religious places in Second Life representing non-denominational, Roman Catholic, Islam, Buddhist, and Mormon communities.